Season Four highlights include dealing with a protest erupting when the Baxters attempt to host the Governor at their home, Harry delivering a hasty marriage proposal to George's Secretary, George proposing a mind-your-own-business rule to discourage Hazel's meddling ways, and Hazel getting thrown in the slammer! SHOUT! FACTORY ON DECEMBER 11! 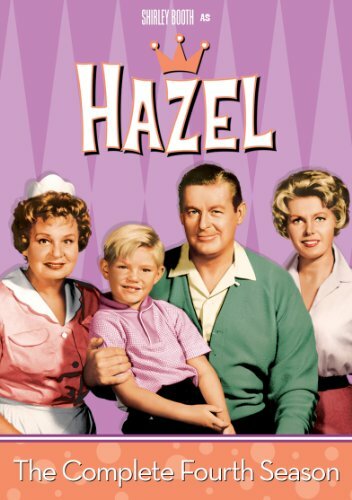 Oscar(R)- and Emmy(R) Award-winner Shirley Booth returns as the smart-lipped maid to the Baxter household in Season Four of the television classic, Hazel, based on the original Ted Key cartoons in The Saturday Evening Post. The 4-DVD set Hazel: The Complete Fourth Season will be released by Shout! Factory on December 11. Bonus features include original promotional material. Starring Academy Award(R)-winner Shirley Booth (Best Actress, Come Back, Little Sheba, 1952) with Don DeFore (The Adventures Of Ozzie & Harriet), Whitney Blake (Strange Homecoming), Bobby Buntrock (The Virginian) and Maudie Prickett (The Andy Griffith Show).